Norwich made it five Championship wins in a row with victory over Hull to move back above Leeds at the top of the table. Jarrod Bowen clipped the post with a free-kick for the visitors before Norwich's Marco Stiepermann weaved into the area and guided home an opener. The Canaries were two up when the ball fell for Emi Buendia to tap in after a David Marshall save, but Marc Pugh pulled one back for Hull on half-time with an excellent touch and finish after an error from keeper Tim Krul. 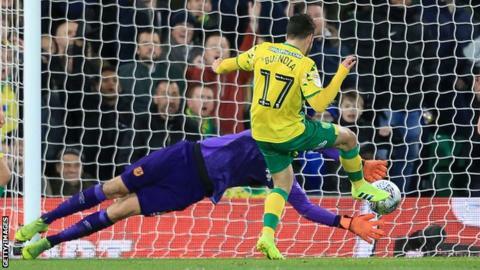 Man-of-the-match Buendia finished through Marshall's legs to make it 3-1 after an exquisite one-two with Teemu Pukki and Norwich held on despite former striker Chris Martin's late header for Hull. Norwich are two points ahead of second-placed Leeds and four clear of Sheffield United in third, with Nigel Adkins' Hull staying 13th. Carrow Road was rocking after the club announced head coach Daniel Farke had signed a new deal until 2022 just minutes before kick-off, but the visitors had the better start until Stiepermann's mazy run and finish. Buendia's first goal was slightly fortunate, coming after ex-Canaries keeper Marshall saved from Onel Hernandez, with the ball ricocheting straight to the Argentine just yards out. Marshall's opposite number Krul gave the ball away under pressure and was punished ruthlessly by Hull's Pugh from outside the box but the visitors have now lost five away Championship games in a row, conceding 16 goals in that time. Norwich's third was started by an audacious flick from Buendia, with Pukki backheeling into the playmaker's path to finish, with Farke's side now only nine games away from a potential return to the Premier League. "A ninth win in 10 is outstanding but the result is more or less ridiculous, it should be 7-1, 8-1 or something like this. "We had one mistake and that could change your whole world in football, but luckily it didn't. We missed an unbelievable amount of chances and then at the end, we had to defend with unbelievable commitment - it shouldn't have been so close. "There was just the wrong choice a couple of times, and especially we weren't smart right before half-time because that momentum shift could've changed the game. We kept on with how we were playing after half-time which was very important. Emi Buendia can create magic on the pitch, nothing he does is a surprise to me." "We started really well but then the first goal we conceded is just unacceptable. He's had nine or 10 touches and danced his way through our defence - end of story. "You set yourself up to give yourself a chance and then concede like that, and then the second goal as well. In the second half we were back in it after Marc Pugh's goal and conceded another poor goal from our perspective. "We didn't get a stonewall penalty at 3-1 before Chris Martin's goal, their defender is nowhere near the ball and that would really have given us a lifeline in the game. Norwich are a really good team, the way they pass and attack but you have to give yourself a chance - the goals are avoidable." Match ends, Norwich City 3, Hull City 2. Second Half ends, Norwich City 3, Hull City 2. Attempt missed. Marc Pugh (Hull City) left footed shot from outside the box is high and wide to the left. Assisted by Manuel Milinkovic. Attempt missed. Teemu Pukki (Norwich City) right footed shot from a difficult angle on the right misses to the left. Assisted by Moritz Leitner. Substitution, Norwich City. Mario Vrancic replaces Emiliano Buendía. Goal! Norwich City 3, Hull City 2. Chris Martin (Hull City) header from very close range to the top left corner. Assisted by Kamil Grosicki with a cross. Attempt saved. Ben Godfrey (Norwich City) right footed shot from more than 40 yards on the left wing is saved in the centre of the goal. Teemu Pukki (Norwich City) wins a free kick in the defensive half. Substitution, Hull City. Chris Martin replaces Fraizer Campbell. Foul by Teemu Pukki (Norwich City). Reece Burke (Hull City) wins a free kick in the defensive half. Offside, Norwich City. Emiliano Buendía tries a through ball, but Onel Hernández is caught offside. Foul by Manuel Milinkovic (Hull City). Attempt missed. Onel Hernández (Norwich City) right footed shot from outside the box misses to the left following a corner. Corner, Norwich City. Conceded by Reece Burke. Substitution, Hull City. Kamil Grosicki replaces Jarrod Bowen. Attempt missed. Ben Godfrey (Norwich City) right footed shot from outside the box is high and wide to the right. Attempt blocked. Jamal Lewis (Norwich City) right footed shot from the left side of the box is blocked. Assisted by Marco Stiepermann. Foul by Eric Lichaj (Hull City). Substitution, Hull City. Manuel Milinkovic replaces Kevin Stewart. Attempt blocked. Kenny McLean (Norwich City) right footed shot from outside the box is blocked. Assisted by Jamal Lewis. Corner, Norwich City. Conceded by Jackson Irvine. Markus Henriksen (Hull City) is shown the yellow card for a bad foul. Goal! Norwich City 3, Hull City 1. Emiliano Buendía (Norwich City) right footed shot from the left side of the six yard box to the bottom left corner. Assisted by Teemu Pukki. Reece Burke (Hull City) is shown the yellow card for a bad foul. Onel Hernández (Norwich City) wins a free kick on the left wing. Foul by Reece Burke (Hull City). Jamal Lewis (Norwich City) wins a free kick in the defensive half.